The wafting odor of feces along a stretch of Falls Road is a sure sign you’re nearing Outfall No. 67, one of the two spots where Baltimore releases millions of gallons of raw sewage from its over-capacity system into the Jones Falls every year. But to find its underground counterpart – Outfall No. 72 at 428 East Preston Street – you should focus not so much on smell as this arresting sight: A building with large cracks along its red brick wall that, in turn, borders a strangely slumping sidewalk and roadway. 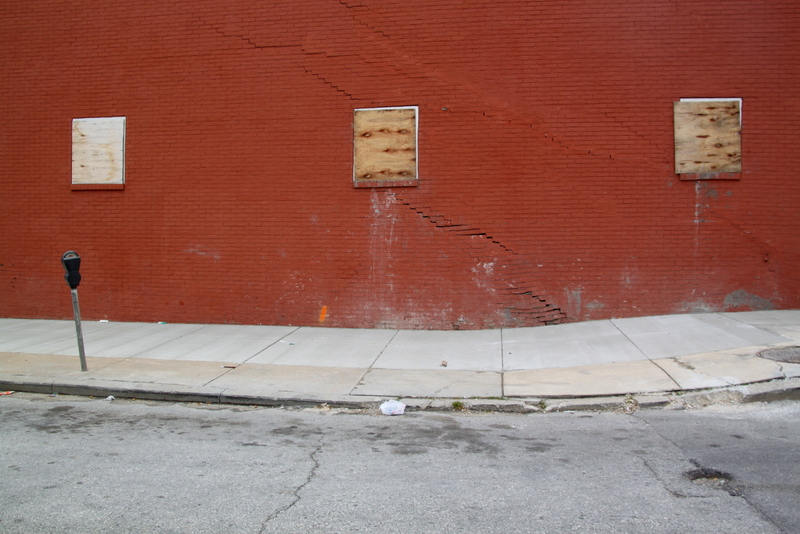 The worst of the cracks, when they appeared last fall, ran right through a window, breaking the glass. That’s why there are now several boarded-up windows on the front of the building – a Maryland Division of Parole and Probation field office. 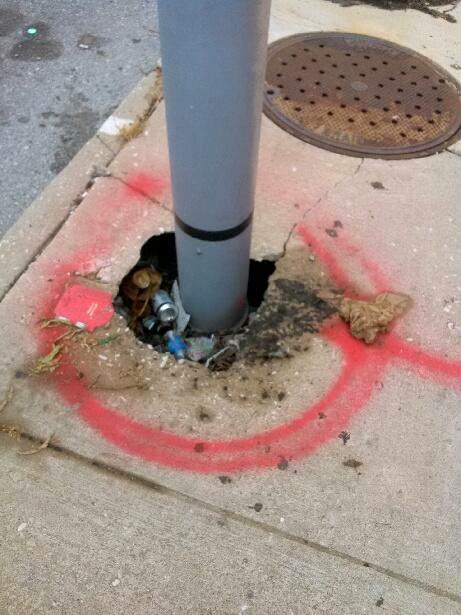 And something else happened when the cracks appeared: a streetlight fell down. “It didn’t fall over – it just fell straight down into a three-foot hole,” said woodworker Joe Clancy, who rents one of the artist studios at 439 East Preston. This building, the Old Post Office Garage across the streets from the parole office, is also cracking and slumping. 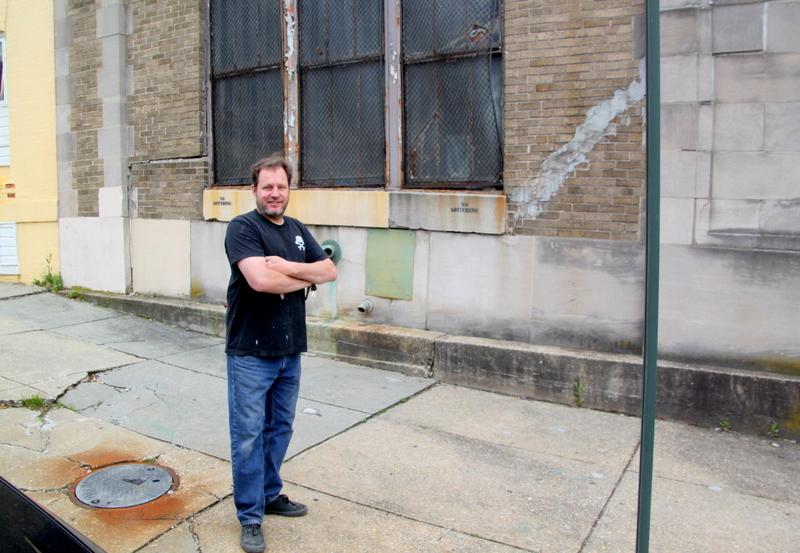 Mike Stallings, who has owned the former garage for eight years, spoke with disgust about both buildings’ cracked facades, the sagging roadway between them, and the multiple instances where murky water gushed up from the street or filled his basement. After “extensive review” by the Maryland Department of General Services and the landlord’s engineers, “the building was deemed safe,” Mark Vernarelli, director of community engagement for Parole and Probation, said in an email to The Brew. The building at 428 East Preston, once owned by Waverly Press, is one of two addresses the city uses to identify its “structured overflow” sewage outfalls. These are pipes through which raw sewage is released into the Jones Falls during heavy rains. The city had promised to close all of its sewage outfalls by January 1, 2016, as part of a 2002 federal consent decree, but have kept these two open. With less than half of the work needed to comply with the consent decree completed, the Rawlings-Blake administration is now negotiating for a deadline extension with the Environmental Protection Agency (EPA) and Maryland Department of the Environment. Meanwhile, sewage mixed with stormwater continues to flow from SSO No. 72, as it did during a downpour on February 24. Over 9 million gallons flowed out at the underground outfall, city officials reported (sewage releases over 10,000 gallons are required by state law to be disclosed). An additional 3 million gallons were released at the 1901 Falls Road outfall. Last Friday during another heavy rainstorm, the outfall released 46,000 gallons of sewage water into the Jones Falls, according to the Department of Public Works (DPW). What exactly is undermining the buildings on this section of Preston Street located just east of the Jones Falls Expressway? Is it the sewer outfall, another utility pipe, unstable fill or a combination of issues that has led to a shifting sub-surface? One way to view the recent problems is to consider that both buildings were located on top of the Jones Falls. 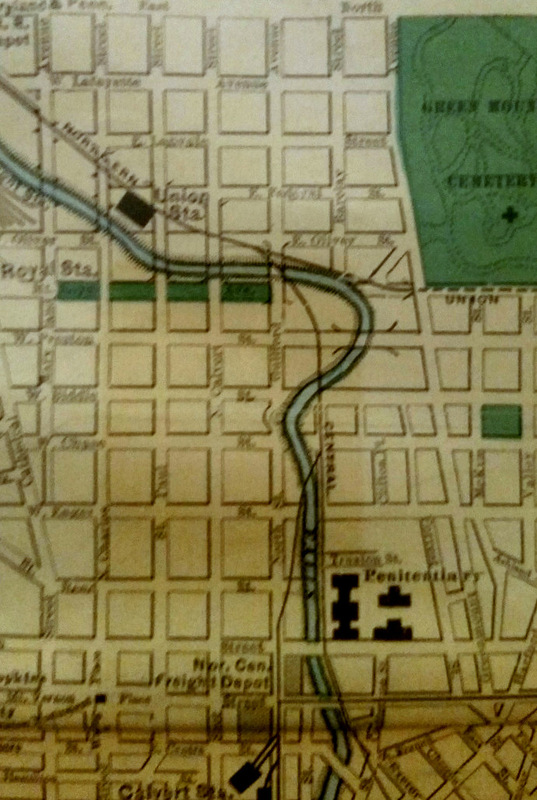 A 1912 Rand-McNally map shows that the original stream made a wide loop at this point, swinging almost as far east as Greenmount Avenue. 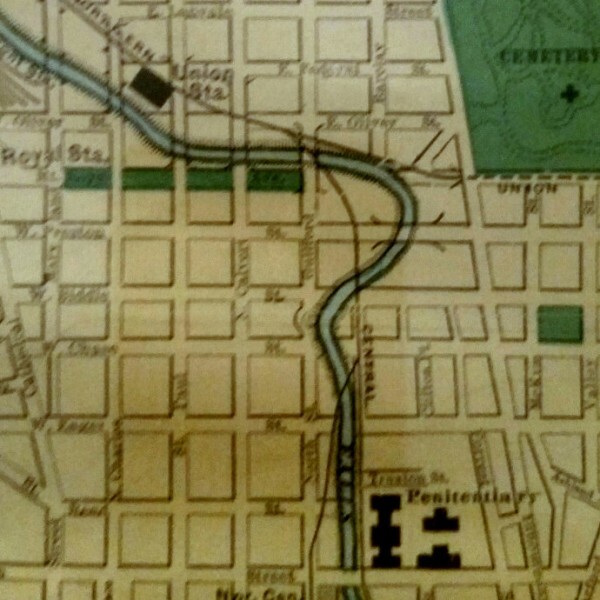 The stream was covered up when the city built an underground tunnel for the Jones Falls 100 years ago. Clancy has pondered the trouble beneath his building for the last few years. When inside the building, he is periodically startled by the loud smashing sound when trucks pass over a large bump on Preston Street. Outside, he sees cracks in the sidewalk and “pucker” in the building’s metal window grates. But the main image that sticks in his mind is the flooding two winters ago in the basement. When he came back a few hours later with sump pumps, he saw something that surprised him even more – all the water was gone. It was one of three incidents he says he has witnessed where the basement flooded and water came up from the street. City workers told him the cause was a water main break. He said he never detected any sewage odor. Recently, he added, there was a geological engineering company stabilizing the 428 East Preston building across the street. He said the property’s owner and the state have been aware of problems at the building since well before the cracking incident last fall. State records list the owner of 428 East Preston Street as Komar Properties Ltd., a company associated with Larry Boltansky, a Pikesville real estate developer and philanthropist. 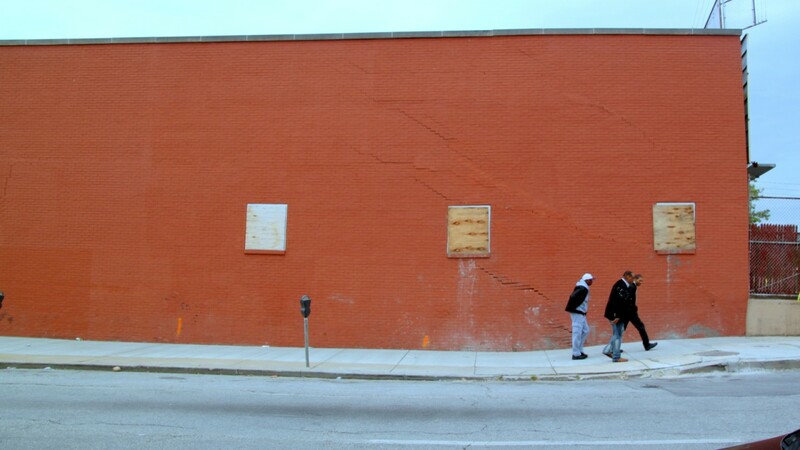 After the large cracks appeared last fall, Clancy said he talked to the crew that showed up to shore up the building. “They said the footer of the building had cracked in half and the building had split in half,” he said. “Then a week later, another crew showed up. They started doing work at night. They were drilling concrete inside and pouring concrete out on the street. They did the work at night because it’s a working office. It seemed obvious they were underpinning the building to keep it from sinking,” Clancy said. State officials describe “substantial repairs” to the building undertaken by the landlord. “Additional supports have been installed under the foundation to eliminate additional settling and to avoid subsequent damages if another break happens,” Parole and Probation spokesman Vernarelli wrote. Stallings said he has complained to the Department of Public Works about the repeated water main breaks and flooding, which he said fills all of the area basements with as much as eight feet of water. “It’s a sewer problem,” Stallings said, and the city is responsible for it. Clancy, agonizing over the subsurface problems he fears might one day force him to leave the building he’s worked hard to fix up, asked one of the engineers last fall what the cause is.